May be the full moon, or perhaps it’s just timing… but we’re backed up by 3000+ articles at the moment and will be back on top again in the coming week. One of our editors just had a brand new baby, another got married, another just came back from a mini-vacation and on top of that, I’m driving a quality requirement for double human approval on at least 10-20% of our daily approvals until we can hire another round of editors to keep up with the incoming load plus our new quality control metrics. The net effect is that we’re backed up a bit more than normal (sorry about that). Where are the cubicles? I like the way the workspace looks. Bright, airy, and people can see and chat with each other. I am thrilled to see you – you have approved most of my articles. Thanks. Chris – It is good to know your editors have happy lives outside of reading our articles. Take a deep breath, the articles will all get read. 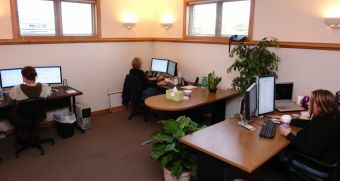 I like the look of the space too – bright, clean, neat, and pretty… looks like a great place to work! I’m patient on my articles (since I’m not writing a huge amount of them right now) because I want this site to remain synonymous with quality – if that means waiting a little longer to know that the reputation stays good – I’m A-okay with that. Appreciate the update. Thanks for the revealing X-Rated photo. I notice someone is holding a cup. Do you actually allow coffee breaks?!! Congratulations to the new parents, the new bride & groom, and hooray for coffee. Looking forward to seeing more pics of staff. Take care. Oh yes, thanks for everything. I’m delighted to see your staging area. it looks like you’re ready for another big job. Thanks for the fast turn around on submitted articles and answering my usually “My fault” concerns and pushing~the~envelope questions. You’ve seen to it that I haven’t been hanged yet. LOL. Where is “Wild Wally” ~ “Kill-Um Casey”, & “King~Pin” Chris”? I too wish to do my part in helping you catch up in your back log, so I will take a break for a while posting articles, I do not wish to over work your staff they seem like great people. Do you know 7 of 9? “Smart move ~ the side profiles :) They’ll never recognize yas in the other article banks!” that is pretty funny. Awesome to see the hardworking editors who help run the EzineArticles empire. I love 7 of 9… and knew a guy who grew up with her… Turns out her birth name is Jeri Lynn Zimmerman. I even have a signed litho from Jeri when I was big into Star Trek (now I like SG1, Stargate Atlantis and Eureka). One of the first things we did when we moved into the new office this past Summer is we replaced all of the flourescent blue/white lights and replaced them with half moon wall sconces with yellow incandescent lighting. Makes a huge difference on the eyes when you’re in front of the monitors all day. Anyone else notice one of our secrets to productivity in the above photo? If you guessed dual monitors on every desk, you win. I call them ‘duallies” (farm implement reference whenever a tractor has 2 tires together on the same side of an axel) and some studies have shown they improve performance by 9-44%. So does this mean you are reading two articles at once? Or, are you checking email on one and working on the other? That is probably what I would do. If you’ve ever flipped back and forth between applications and you started wondering how much faster you could be productive if you could see two screens at once, you’d then know the value of dual monitors. I’ll often be creating a blog entry in one monitor and reviewing a link or a resource or a photo or something else in the other monitor… or when I write articles, I’ll have my editor in the left monitor and supporting research in the right monitor. If my notebook computer could drive more than two monitors, I’d have 3 or 4 by now. To make my Dell M1710 XPS notebook drive dual monitors while being docked at the same time and with dual DVI connections (SVGA is so last decade), I had to get an advanced docking station that would support a PCI card and I went with the ATI PCI FireMV 2200 Multi-View Graphics Accelerator card. This really makes a lot of sense. Thanks for giving us a glimpse inside the office. Now I feel even more like ‘family”. You’re doing some fantastic work folks and this is such a great service for writers. Thank you for all you do for us. Convey my regards to all your team members; they are doing a great job! We edit, quality control, and process everything digitally. In fact, there isn’t even a printer in the editors room and the main printer we have rarely gets used.